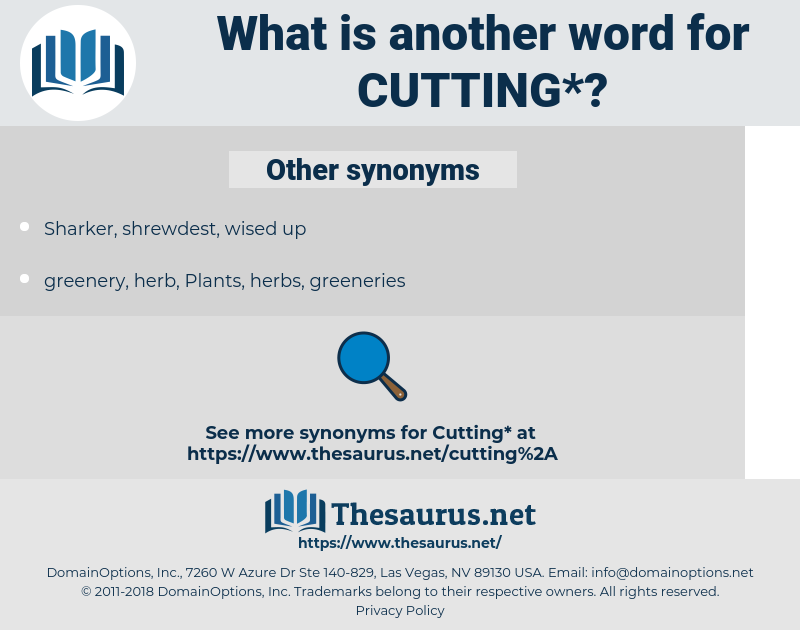 What is another word for cutting? Slitting, nipping, clipping, trimming, crosscutting. Narrows, reducing, drags, less, cutoff. 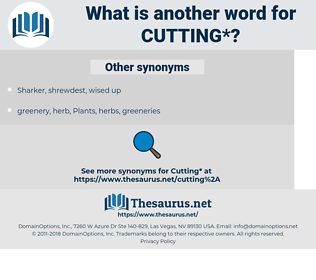 clipping, Felling, curtailment, reducing, cutback, downsizing, narrowing, Slaughtering, harvesting, Mowing, Culling, cutout, blending, interruption, circumcision, less, mutilation, sectioning, retrenchment, lessening, cutoff, slaughter, ablation, beheading, cutter, Cropping, discontinuation, shrinking, mitigation, Maiming. Curtailing, Discontinuing, curbing, resurrecting, intersecting, downgrading, intervention, Deducting, vermindering, decommissioning, touching, touches, Interrupting, diminishing, Puncturing, streamlined, streamlining, Ceasing, minimising, Eliminating, Experiencing, slicing, uprooting, Truncating, belittling, intervening, Detracting, disregarding, Excluding, constraining, Flattening, Containing, Terminating, Mitigating, Eradicating, Effecting, Canceling, Cancelling, Separating, penetrating, Precluding, affecting, slashing, tableting, intruding, sawmilling, ameliorating, Economizing, limiting, Combating, depreciating, coming, Traversing, moderating, Suppressing, receding, squeezing, Removing, declining, Suspending, Extirpating, Extracting, leaving, withdrawing, confining, Incising, recording, conserving, response, knocking, register, Registering, Deleting, concerning, carving, Overcoming, Simplifying, highly, impeding, tackling, returning, blocking, dwindling, interfering, Addressing, Levelling, assembling, double, doubling, Transporting, Disrupting, Deterring, dividing, Ignoring, Undergoing, Dismissing, ousting, inhibiting, isolating, Relieving, cheating, subsiding, entering, Reversing, deciding, Depleting, Stemming, ending, stripping, deepening, abating, Disposing, softening, crossing, Preventing, bleeding, Preparing, transiting, reaching, defusing, Depriving, hindering, Abolishing, Restoring, losing, arranging, controlling, Destroying, resulting, sending, flying, scrapping, moving, Impairing, Rabbiting, tapping, speeding, Deposing, dragging, widening, rendering, eroding, closing, Avoiding, Phasing, Lifting, dropping, digging, past, filling, Claiming, taking, thinning, looking, Waiving, pulling, shipping, talking, sparing, relaxing, Spanning, keeping, Erasing, Aiming, Denying, sinking, giving, die, eating, drawing, den, winning, passing, la, Felling, slowing, letting, reducing, getting, Doing, drinking, going, shortening, making, downsizing, narrowing, Slaughtering, harvesting, Culling, blending, less, sectioning, lessening, severing, beheading, Cropping, shrinking. indefinite, weak, stupid, soothing, unintelligent, gentle, mild, sweet, blunt, bland, dull, pleasant, kind, nice, calm. good-natured, honeyed, hospitable, gracious, level, balmy, urbane, sportive, affable, merry, playful, soft, flat, hot, sociable, slick, luscious, dulcet, diplomatic, rounded, amusing, cordial, polite, smooth, Nectared, even, saccharine, suave, obtuse, genial, waggish, good-humored, droll. He kissed her again, cutting short her promise. And she can say pretty cutting things. cheating, chiding, customize, chasteness, catananche, chastening, cationic, cottonwick, cattiness, coating, ceding, cadenza, customs, cacodaemonic, cacodemonic, customshouse, chthonic, cotinga, cow dung, cussedness, Ciudad De Mexico, cotton mouse, customhouse, chattanooga, coexistence, casting, costing, cotton cake, coding, custom-make, coccidioidomycosis, catatonic, cadence, customise, coccidiomycosis, cadency, Coco De Macao, chitinous, cotinus, Cutinize, cuteness, coexisting, coetaneous, cutaneous. notch, slash, slicing, nick, gash, section, severing, severance, scission, snick, incision, dissection, undercut, surgical incision. division, creating by removal, opening.